A very light, soothing oil that deeply hydrates and moisturizes the most sensitive and delicate skin. Contains esters of Vitamins A, C & D. Specially formulated for people with irritated skin to reduce visible redness, and people with severe dry skin. 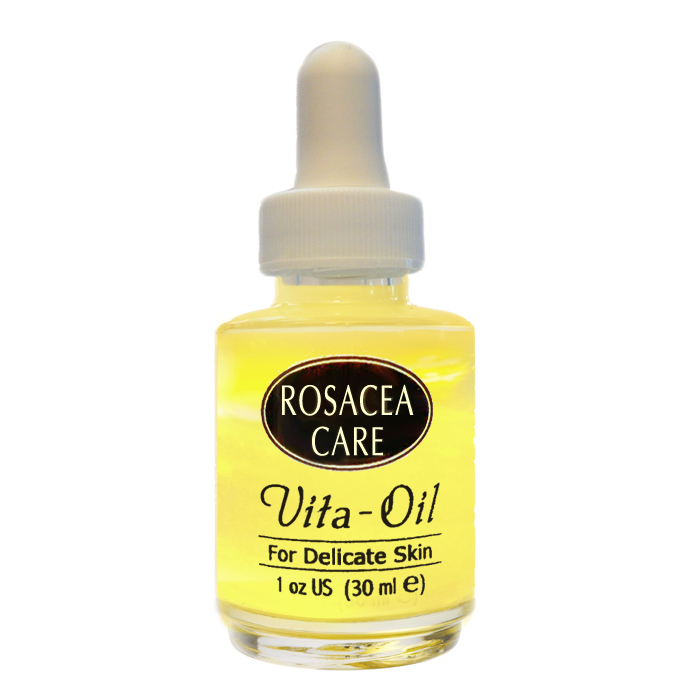 Vita-Oil does not occlude the skin or prevent medicated products from being absorbed. And it will not clog pores. Vita-Oil can also be useful for sensitive skin starting an anti-aging regimen. Tip: for best results apply on slightly wet skin, or over Rosacea Care Serum. Jojoba oil is a popular and well-tolerated part of many rosaceans moisturizing regime. It blends well on wet skin and gives an excellent moisturized feel to it. 1. Jojoba oil in our Vita-Oil is processed to remove contaminants & microorganisms. Natural oils are easily contaminated especially if water is allowed to get into the product. We provided a dropper with our Vita-Oil for better control in using the product. 2. Vita-Oil's effectiveness is increased by lecithin. This is a natural phospholipid similar to the lipid in our epidermal barrier. Vita-Oil will mix with the water because of the presence of a natural emulsifier, and this is what increases its hydrating power. 3. Vita-Oil also contains esters of vitamin C & A which serve as anti-oxidants. Anti-oxidants have beneficial effects on the skin. * This clean product is especially useful for hypersensitive skin. Simmondsia chinensis (jojoba) seed oil, lecithin, ascorbyl palmitate, zea mays (corn) oil, retinyl palmitate, cholecalciferol, propylparaben. Gently massage 1-2 drops of Vita-Oil on eyelids, face and neck each morning and at bedtime. For best results apply on wet skin.